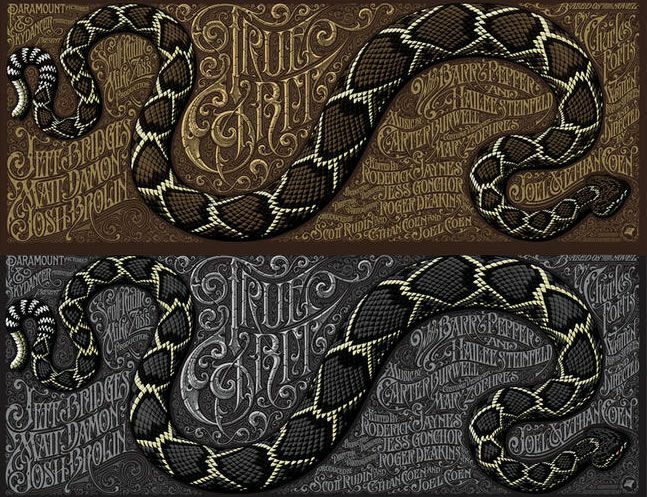 On Wednesday, Mondo will be releasing two new posters for the Coen Brothers’ True Grit designed by Aaron Horkey. While the posters are a bit too busy for my taste, they’re certainly eye-catching and like with all Mondo posters, I’m sure it will sell out in a matter of minutes. Hit the jump to check out the posters, which measure 39″x15″ and use metallic inks. The regular gold version costs $60 and is limited to an edition of 400 while the silver variant costs $120 and is limited to an edition of 110. The posters go on sale at a random time so be sure you’re following @MondoNews for the announcement. True Grit stars Jeff Bridges, Matt Damon, Josh Brolin, and Hailee Steinfeld. The film opens Wednesday. Mondo is the Alamo Drafthouse’s collectible art boutique, featuring designs from world famous artists based on licenses for popular TV and Movie properties including Star Wars, Star Trek & Universal Monsters. The posters are limited edition & screen printed. The posters sell out at AMAZING speed.